Some confrontations are planned. Some are spontaneous. This one was planned, but nothing happened the way it was supposed to. 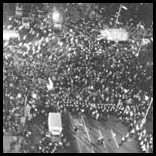 Many months before the Chicago convention, experienced movement activists decided that it would be an ideal place to confront "the system" and demand an end to the Viet Nam war. They invited one hundred thousand people to come and demonstrate. 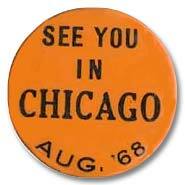 The City of Chicago responded by refusing to grant permits for any marches and for only one rally. The expected masses did not show. 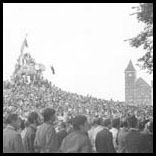 Only a few thousand people participated in the demonstrations; most of those were local, or had come to support their favorite Democratic candidates. They were swept into the protests by events more than by intention. Outnumbered by law enforcement by five to one, 589 people would be arrested while the Democrats met in August, and many were injured. 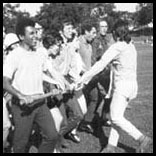 The major battles were fought in Lincoln Park, three miles north of the Loop (the city center), when the police tried to enforce evening curfews. A legal rally in Grant Park ended when the police clubbed a teenager who was lowering an American flag, and others who tried to protect him. 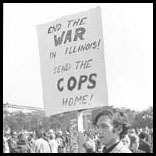 Mayor Richard J. Daley called out 7,500 members of the Illinois National Guard to reinforce the 12,000 police officers. Wednesday night they tried to remove everyone -- mostly party volunteers, candidate supporters and tourists -- from Michigan Avenue in front of the Hilton hotel, which was the convention headquarters. 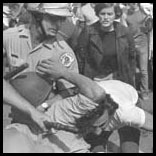 While the nominating speeches were being given at the amphitheater several miles away, these unlucky people were pushed through plate glass windows when caught between Guard and police as they dispersed the crowd. TV cameras in front of the Hilton captured the confrontation. 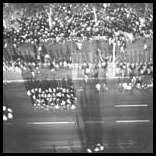 When these images were played on monitors at the convention itself -- about an hour later -- they disrupted the proceedings far more than the demonstrators could have had they succeeded in their efforts to march. "The whole world is watching" became more than just a slogan. 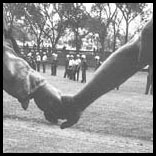 What an official report later described as a "police riot" did more damage to Chicago's reputation and the fortunes of the Democratic Party than anything the protestors could have done. Protestors train in Chicago before the convention. Police and protestors face off in Grant Park. Police club people attending the one legal rally. 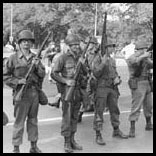 The National Guard is called out to supplement the Chicago police. In front of the Hilton, people flow into the streets while the National Guard lines up to drive them out. The National Guard keeps the people away from the headquarters hotel while Democratic delegates hear the nominating speeches miles away. One young McCarthy volunteer speaks for many. In Grant Park, demonstrators "take the hill" and climb onto the statue of a Civil war general after the police refuse to let them march.